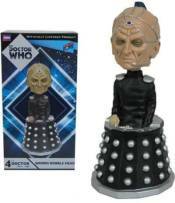 Doctor Who Davros Bobble Head: "You cannot exist without me." Archenemy of the Doctor! Creator of Doctor Who's deadliest enemies, the Daleks! This bobble head is true to the British television series Doctor Who. Davros features nifty details, like a microphone and head wires!Davros, Doctor Who's archenemy and creator of the Doctor's deadliest enemies, the Daleks, deserves his own bobble head if any villain does. And here it is! The mad scientist from the planet Skaro stands tall in 7-inch scale, crafted in resin, and true to the long-running British television series. He features nifty details like a microphone and head wires, and that oh-so-handsome face. So, to paraphrase Davros, "you cannot exist without him. "Produced by the BBC, Doctor Who is the longest-running sci-fi TV series in the world. The award-winning show presents the adventures of a time traveler known simply as "the Doctor." Along with his companions, this mysterious Time Lord journeys through time and space using his TARDIS, which appears from the outside to be an ordinary police phone booth.